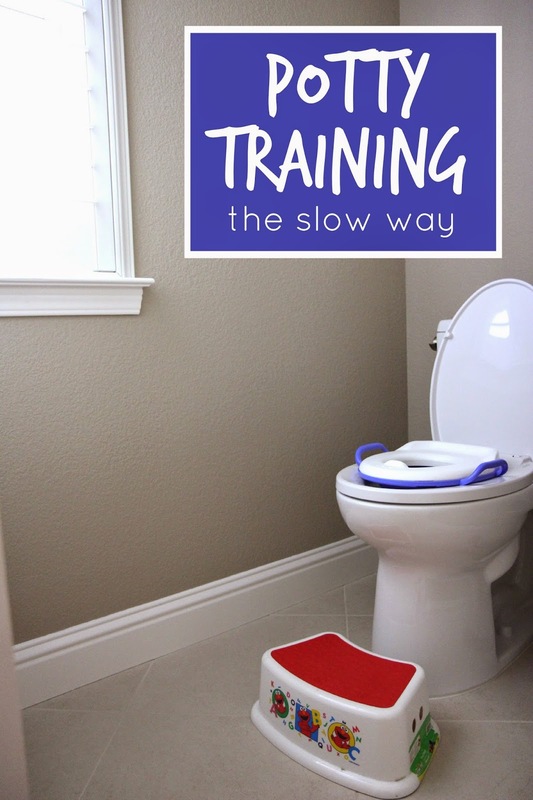 Potty training is something that I have always dreaded ever since my kids were born. All I had heard from parents was that it was messy and annoying, and I definitely won't disagree with that, but today I'm going to share how we potty trained both of our oldest kids in a positive way and how going at a slower pace worked for us. The way we did it isn't actually that slow, but compared to all of the competitive strategies I've seen out there, it is definitely slower. I had high hopes that doing a quick potty training method would work for our kids, since I had seen a lot about them, but realistically it took much longer than a few days for our kids to be potty trained by my definition of the word. When I use the word "potty trained" in this post I am talking about kids going for weeks at a time without any accidents and without me needing to remind them to go to the bathroom every thirty minutes or even really at all. I definitely still remind my kids to go before we go in the car on a long drive or if they are in a new place and really busy, but most of the time they are in charge of that and I don't have to think about it. Other people's opinions about when I should start (every kid is different so I decided early on that I wasn't going to let someone who had a kid potty trained really young make me feel like that meant that I need to work on that with my child when we weren't ready). My kids all got potty trained around age three. Some will train earlier, some a bit later. It is not a competition. Preschools that required kids be potty trained by a specific age (I didn't want to feel rushed into making my child perform a specific way if he wasn't ready for it yet). After a lot of research I also kind of avoided books and resources that said they would work in a certain amount of time. I didn't want to put lots of pressure on myself and my kids and instead wanted to take things at their pace as much as possible (with a little help). So far I've potty trained two of my kids (a boy and a girl) and the main thing that guided me when I potty trained them was MY readiness... not theirs. When I was 100% ready to commit to helping them be successful with potty training, then we got started. In our case both of my kids were a little older than three. I read a lot about potty training readiness prior to getting started and my son was definitely interested in the potty. My daughter appeared to have no interest or desire to ever be out of diapers but I knew that if I helped her get excited about it she would probably change her mind. A lot of people recommend potty training in the summer or spring but we travel so much during that time frame that I chose winter time (January/February) for both of my kids. It was cold outside and usually rainy and we were indoors a lot and able to stay home. I basically cleared all unessential things from our schedule for about two weeks. With my oldest that was really easy but with my second child we still had to work around my son's school schedule. Fortunately I had several kind friends who helped me with carpooling for the first day or so so that I could concentrate on potty training. For the first several days of potty training we camped out in the bathroom and in the area of our house that wasn't carpeted. I brought toys out of bedrooms so that they were close by us and we just played and read and occasionally watched movie or two. The days were really long. We drank all day long using cool cups we'd gotten specially for potty training. I gave my son salty snacks to get him thirsty and then he'd want to drink more and then he would need to go to the bathroom more. My goal was to get his body in the habit of going and have him practice sitting down on the toilet a lot. We used sticker charts that were created based on each child's interests (Olaf, Trains, dogs, etc.). We set a goal to earn 5 stickers and at first each time my son went to the bathroom in the potty he got a sticker. Ahead of time we decided on a special reward once each sticker chart was filled. Some rewards were tangible items (like treats) and some were experiences (like trips to the park). As he got more consistent we changed the 5 sticker chart to a 10 sticker chart... then to a 20 sticker chart. As we trained longer my son got prizes less often. After about a week we had almost completely faded the prizes but we still gave stickers and lots of praise. I covered all of my furniture and carpeted areas in the main parts of our house with waterproof tarps and towels. Call me crazy but I have nice rugs and I didn't want them to get peed on. As my son gained more control over the first few days he got to leave our spot by the bathroom and roam around the house again. Once he showed me that he could go for a full day without having any accidents then he earned the opportunity to sit on my couches without needing a towel or tarp underneath him. If he had an accident my response was to have him help me clean it up and go and have him sit on the toilet again right away just in case he had more coming. Afterwards we would talk about how accidents happen and he is just learning and we'll keep trying. For the first while we moved the little potty around the house with us so that he could get to the bathroom realy quick. After awhile we stopped doing that because sometimes we would forget to bring the potty where we were and instead of going he was looking for the potty. To make things less complicated we left the potty in the bathroom from then on... so that the potty was always consistently where it was supposed to be. During the day and when we were taking short trips in the car around our neighborhood my son wore training underwear (thicker than normal underwear). For nighttime and any excursions out of the house that were not close by we used Pull-ups. I also like to keep a few extra pull-ups in our car since for some reason having a stack of them is easier and more useful for me than having a stack of underwear in the car. For the first while I had my phone timer set to go off every 15 minutes so that my son could try going potty. Eventually I faded it from 15 to 30 to 45 to 60 minutes. If my son or daughter was going over to a friend's house for the first few weeks I always put them in a pull-up instead. Although I would have them go to the potty when I dropped them off and also show them where it was, sometimes with the new environment and new toys and a mom that didn't know my child's cues as well, sometimes it was easier to just have my kids in pull-ups. Often they would catch themselves and make it to the potty just in time... but I liked having the pull-up on just in case. We didn't use pull-ups every day during potty training (except at night), but they were definitely available if we needed them. Some friends would put the underwear underneath the Pull-up so that their child would feel the wetness quicker but would still have the Pull-up to contain any mess. To keep things less stressful for everyone, we worked on daytime potty training first and stuck with Pull-Ups at nighttime. My daughter loved how the Pull-Ups could let us know if it was wet by the flower on the Doc McStuffins Pull-Up getting darker. I know some recommend doing nighttime and daytime training at the same time and just getting rid of diapers and Pull-ups, but we didn't and I haven't regretted it one bit! Now that we are getting ready to fade the nighttime pull-ups we've joined the Pull-Ups® Big Kid Academy. Everyone gets a personalized “My Pull-Ups®” page with potty training activities and advice customized to your point in the potty training journey. I actually wish we'd known about this before we started training, but we are excited to spend time on there now... especially reading about solutions for nighttime. The Big Kid Academy has a world-class library of potty training tips and advice from parenting experts, medical professionals and parents who have been there. Subjects include: How to talk to day care providers about potty training, Solutions for nighttime, Potty training on the go, and the best clothing for potty training. Another thing we did while we were potty training is we kept very simple clothes on our kids. My son wore pants with an elastic waistband around the house and my daughter ran around in just a t-shirt and underwear, which definitely made going to the bathroom quicker. Lastly, probably the most important thing that I did while we were potty training was put on my game face and smile and be happy and encouraging. I was dreading potty training my daughter and I actually discovered that the entire potty training experience was really great for our relationship. My daughter flourished with so much praise and attention. She has struggled with anxiety and also always feels inferior to her older brother and I think potty training was the first time she'd been successful and accomplished a goal that she had set for herself. She glowed anytime anyone praised her. She was so proud of herself and I was proud of her too! After about two or three weeks my daughter was almost 100% accident free. She occasionally has a regression depending on what is going on in her life, but for the most part she is trained. We are still working on some of the dressing skills needed to help her get her clothes on and off properly, but it is coming along! 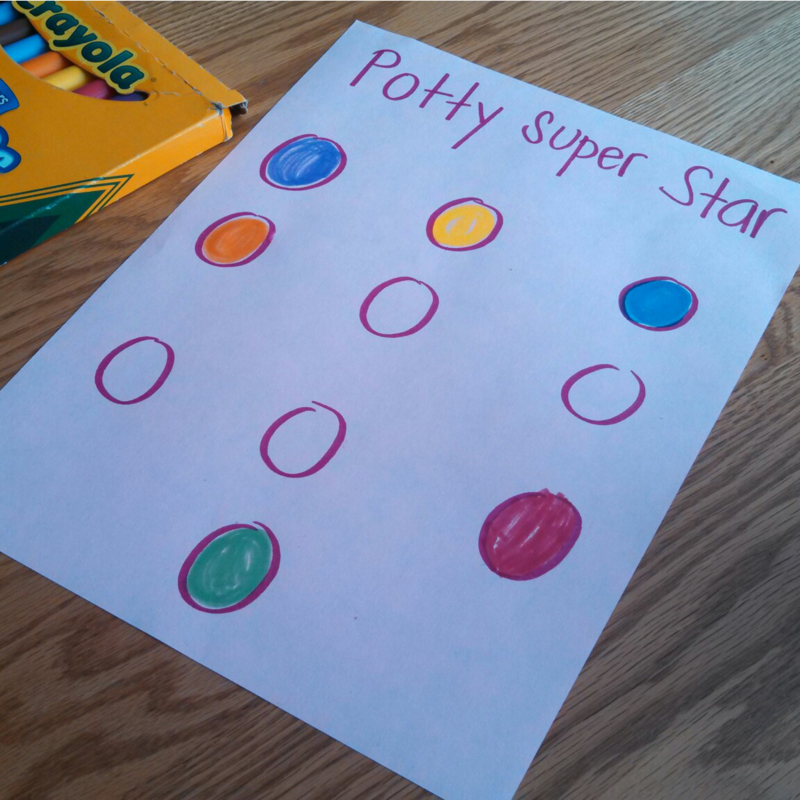 In addition to sharing a bit about how we did Potty Training at our house, I have been collecting some favorite Potty Training Resources on a pinterest board and I have been adding to those resources daily. Do you have any favorite blog posts or articles about potty training I should add here? Do you have any questions about potty training? I get questions daily and I've been trying to post them on our Facebook wall so that some get answered. Here are two questions I've gotten recently... feel free to chime in and pass along an answer or any advice! 1. I have a 3 year old boy who has been almost completely potty trained for close to a year. He still wears a night time pull up. Lately he hasn't been telling me he has to go at all. If he gets upset (mostly when I put him in time out) he will pee his pants. It's like he doesn't feel like missing out on anything and will just go on the spot. I'm very upset and would appreciate any help! 2. My 3 1/2 year old son just won't poop in the toilet. He pees in it and doesn't wet the bed, which is great if only he would poo in it!!!! I have tried everything from telling him he would get a big surprise to reading to him while he was sitting in the toilet to letting him watch Fireman Sam on his portable dvd player. I would appreciate any tips. That would help!!! Any ideas for these readers? Have any other questions? Feel free to submit any questions in this form so that they can be added to my reader question spreadsheet to be posted in Facebook. Also, don't forget to enroll in the Pull-Ups® Big Kid Academy! 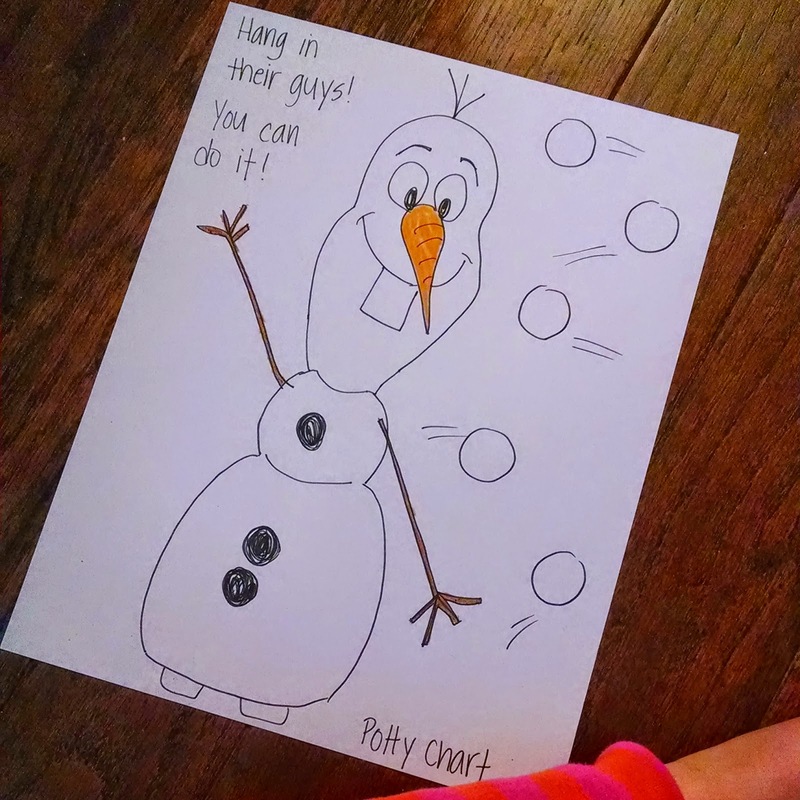 My favorite part about the Pull-Ups® Big Kid Academy is that you can get special coupons on products! The potty celebration section on the site is pretty awesome too. Many thanks to Pull-Ups for sponsoring today’s story and creating the Big Kid Academy for us Potty Trainers. I just have to say that I love your philosophy on this because ours is so similar! Thank you for this great post! The timing of your post is perfect! We're just about to start potty training with our 2.5 year old. Thanks for the link to the Pinterest board of additional resources. I love that you started slow and with the mindset that not all children are the same. It's important to respect that they too have their own individual internal clocks and we can't expect them to follow the "experts" rules. Each child learns at his/her own pace. Potty training was never my favorite either as a preschool teacher (can you imagine 12 children in a classroom potty training!). As a parent though, I was all in. We used pull-ups too at night and on long trips. My favorite potty seat was the baby bjorn toilet trainer, and we used underwear that had a light padding (sold at Target where they have all the onesies and toddler underwear). I also started putting the underwear on my babies way before I was ready to commit, just to get them used to the feeling of not having a diaper. I'd let them play around the house for about 10 minutes at a time with the underwear, then put their diaper on after. My biggest worry was they would get stressed out and regress. Luckily that never happened. S L O W is key in our household too. Great idea about waiting till winter too! You're right, people are home more often around that time, so it makes perfect sense to do it when you're at home more. Great post! Did I miss where you said how old your childrenn were when you started this? They were both right around age three anonymous. Some kids do it earlier, some a bit later. Three was perfect for them. Every child will be different. FOr question number 2: I have read that kids sometimes have issues with pooping in the potty, since they see the poop as part of them (they don't get this same connection to pee I guess). SO they get scared that part of them goes down the drain. FOr the life of me I can't find the article I read about this, but I am sure you could find something on pinterest or a blog. -Reward ideas when you don't think stickers will be enough to motivate your little one and you don't want to give them tons of candy? -Tips for doing potty training gradually, or do you really need to take a few days just hanging out around the house to do it? I had to deal with a MIL who had her kids trained at 18 months telling me how it's done, and that's no fun. Don't let anyone make you feel bad for when and how you do it. Do what works for you and don't be afraid to take a break and try again later if it just isn't working. @hintmama, I am using a gradual approach with my son. He is in diapers, but we sit on the potty after each meal and any other time he indicates the need. He is only 12 months right now, so it is a bit hit and miss, but he is moving forward and has even begun to try to tell me when he needs to potty, so I would say that gradual can work. With my son we just use a lot of praise and he always has a big smile when he goes on the potty and I tell him how awesome he is. My niece also reacted best to the excessive praise method. Like if she went potty we would come out and say something like "oh my gosh, grandpa, you will never believe what this big girl just did; she pooped in the potty!" And then someone else got the chance to praise her for it and she relished the praise (she was more like 2.5 when she was training). My nephew's encouragement was that he wanted to go to vacation bible school (he was 3), but you had to be potty trained for that, so you could also have some event that your kid works toward as an end goal. Some people use the underwear as a reward. You let them pick out some cool underwear and then set a goal that they can wear it after (like 5 days with no accidents and you can wear them). 1. Interval pottying instead of demand. If he has to sit on the potty once every hour (for instance) anyway he won't be missing anything by using it while there. Peeing in time out is tougher, though. Idk. 2. Maybe just because it is working for me, but figuring out when he usually poops (often after meals) seems like the best place to start. Put him on the potty just before the time he normally poops then entertain him while he is there (what you're doing seems good). Have him sit until he poops or won't be entertained any longer. If he poops, praise and rewards. Also you might try a specific toy, book, show, whatever that he only gets on the potty to get him interested and willing to stay long enough to make it happen. Lastly, if his poop is easier to pass it is more likely to come out on the potty, so you might try some juice or juicy fruits.